R-Studio detects and processes valid hardware volume sets and RAIDs like regular drives/volumes. R-Studio can analyze and recover data from software volume sets and RAIDs . If a software volume set or RAID is present in your system, R-Studio detects it, and a Volume sets and RAIDs object appears on the Drives panel. This object can be searched for files, scanned, and files found on it can be recovered the same way as from normal drives/volumes. If, due to hardware failure, a hardware volume set or RAID cannot be accessed, or due to data loss your system does not recognize a software volume set or RAID , and you know what hard drives were in it, you may create a Virtual volume set or RAID and process it like a real software volume set or RAID or hardware volume set or RAID . You may find more information on RAID data structure in Wikipedia . 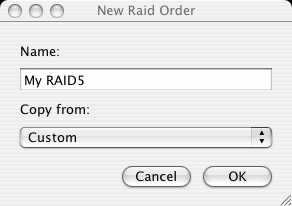 You may create and save your own RAID configurations for non-standard RAIDs. You may specify Offset, Block order/size and Row count. See Working with Advanced RAID Layouts for details. 2 Specify the name for the configuration on the Preset name dialog box. 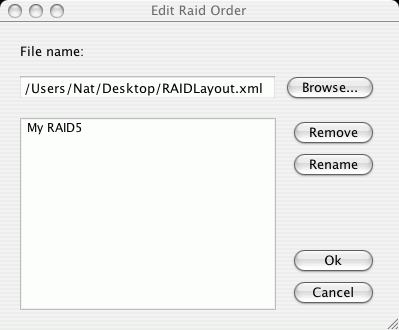 The configurations are stored in the user's RAID layout file . The path and name for this file is specified on the R-Studio Settings dialog box. If no file is specified, R-Studio will ask you to enter the name. If there're objects in the Parents tab, the preset will be applied to them. If the Parents tab is empty, R-Studio will search the disks listed in the Drives tab for the parents in the user's RAID layout file . If the search fails, R-Studio will show the Reference Parents not found message. 2 Select the required configuration on the Edit Block RAID Layout Presets dialog box. > The new configuration parameters will be saved. You may turn the objects in the virtual RAID or volume set on-line and off-line by selecting/clearing the checkbox on the Parents tab. It may be useful, for example, if you need to see which disk is non-actual in a RAID5. Actually, when you turn an object off-line, R-Studio substitutes it with a Missing Disk or Empty Space object. If one partition from a hardware volume set or RAID or software volume set or RAID is absent, due to hardware failure, for example, you need to add a virtual missing disk in order to correctly re-construct the hardware volume set or RAID or software volume set or RAID structure. The missing disk should be placed in the same place as the missing partition. Note: R-Studio does not write anything real on the disk. Missing disks are virtual objects that do not affect actual data on the drive.